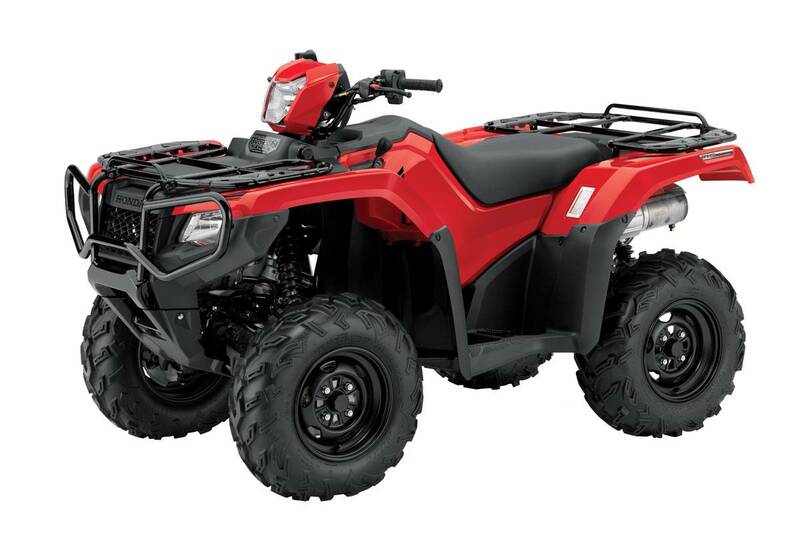 The TRX500FA6 boasts bold styling, Independent Rear Suspension (IRS) and a 500-class engine featuring Honda's advanced dual-range automatic Dual Clutch Transmission (DCT). The automatic DCT provides the compact size and strength of a manual transmission (no belts to slip, break or burn out) with the convenience of an automatic transmission, while giving the rider the option of push-button manual control via Honda's Electric Shift Program (ESP®)Legendary Honda 500-class engine is tuned for loads of pulling power along with a broad, easy-to-use powerband. New independent double-wishbone front suspension delivers 185mm of travel. Adjustable spring preload featured on all shocks to allow suspension tuning to match varying loads and riding conditions. New independent dual-arm rear suspension design offers a more optimal shock ratio and increased suspension stroke for 216mm of travel. New dual-purpose lever makes it easier than ever to engage Reverse gear as well as setting the parking brake. Simply pull the lever to engage Reverse; push the lever to set the parking brake. New dual-purpose lever makes it easier than ever to engage Reverse gear as well as setting the parking brake. Simply pull the lever to engage Reverse; push the lever to set the parking brake. Larger 190mm dual hydraulic disc brakes up front and 170mm hydraulic disc brake in back for strong stopping power. All-steel front and rear carriers are larger and offer more load capacity: 45KG up front, 85KG in the rear. Flat plates on carriers facilitate loading and offer multiple tie-down points. Heavy-duty trailer hitch with 599KG towing capacity. The automatic DCT features a dual shift-mapping program that automatically selects between two transmission shifting modes- either Cruise or Sport mode- for optimum shift timing depending on the rider's pattern of throttle operation. During aggressive use, the Sport mode kicks in and holds the transmission in gear longer before shifting to deliver more aggressive performance. During more casual operation, the Cruise mode allows the transmission to shift up sooner for more casual performance and enhanced fuel efficiency. New Drive/Low sub transmission offers two selectable gear ranges to match varying riding conditions. Honda's Programmed Fuel Injection (PGM-FI) system yields improved throttle response and smooth power delivery, and aids fuel economy for greater range. Honda TraxLok 2WD/4WD system offers 2WD, 4WD, and 4WD mode with locking front differential to optimize traction.